Belly button piercings are one of the most common body piercings around. These piercings are typically seen on women. The top, bottom or sides of the navel can be pierced and adorned with a variety of jewelry options to achieve different results. The size of the jewelry you use in your belly piercing can dramatically change the effect. This large, cascading jewelry fills the naval and trickles to the belly below. One of the benefits of having a naval piercing is the ability to wear a variety of different jewelry there. This fancy piercing has a dangling heart that falls onto the lower belly. This jewelry features two dangling charms for added detail. Be careful with this type of jewelry; if it becomes tangled, your piercing can get irritated. Add a large charm to your belly piercing to make a statement and attract some attention. This butterfly fits the navel beautifully, bringing the eye to the area. If you don't like the idea of cascading jewelry, you also have the option of using a simple or decorative barbell. This barbell has a colored insert on one side and a decorative end on the other for subtle detail. While cascading jewelry and barbells are relatively common, you can also get your navel pierced with a simple ring. The ball in the center can be changed out to vary the look. Technically, you can use any type of piercing jewelry in your naval, but because the top and bottom of the pierced site are visible, using jewelry meant for another area - like this earring stud - may look a little out of place. Use this technique only if you lose your normal jewelry and want to keep the hole from closing while you get to the store. While the top of the navel is the most commonly pierced site on the belly button, the lower area can be pierced as well. Use the same type of jewelry in this area as you would the upper area. For an eye-catching effect, consider using multiple piercing sites around the navel. 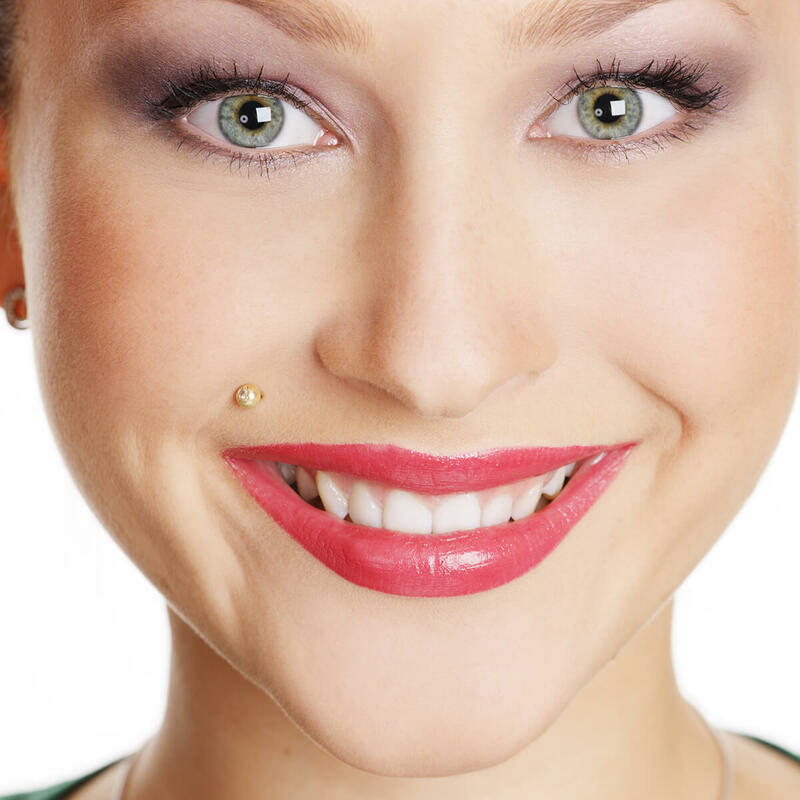 This photo shows three different piercing sites. Remember that in multiple piercings, both sides of the piercing may show, so plan each piercing site carefully. During the early months of pregnancy - and later for women whose navels don't pop - it's possible to continue wearing your belly jewelry. Be prepared for some stretching of the piercing site as your belly grows. This stretching could irritate the site of the piercing. Regardless of how the piercing feels, plan on removing it before labor begins in case you need to have a cesarean. Whether your jewelry is understated or flashy, it's no surprise that navel rings remain one of the most popular types of body piercing. Check out the various types of belly button jewelry available to you and pierce away.